The new DLC SmartPhone Tripod Mount will accept almost any smartphone on the market today as the mouth opens to 2-3/4" wide. Pads on the top and bottom of the jaws not only product the smartphones surface, but also ensure that the smartphone is held securely. 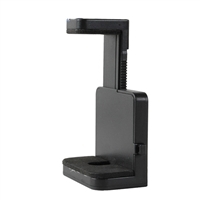 A button on the side of the mount allows the phone to be quickly removed from the mount. The bottom of the mount has a female 1/4"-20 thread.